Okay, yeah. I'm pretty pretty convinced that only a handful of you remember my age-old fic "That's What Friends Are For." Basically, Fox fights Ganondorf and Bowser, winning barely. The two try to attack him, but Link shoves him out of the way and takes the hits himself. Very sad. But it was one of my old fics, so it was kinda cheesy. You can go read it if you want. awww, poor link, it's bad enough he has to go on this big journey, and now this? What did fox did to Link? He masacred the poor kid. I saw this pic and Busted out in tears! D> That is soooooooo sad!! That even sounds like what happened my new stories! But I luv this pic sad or not! 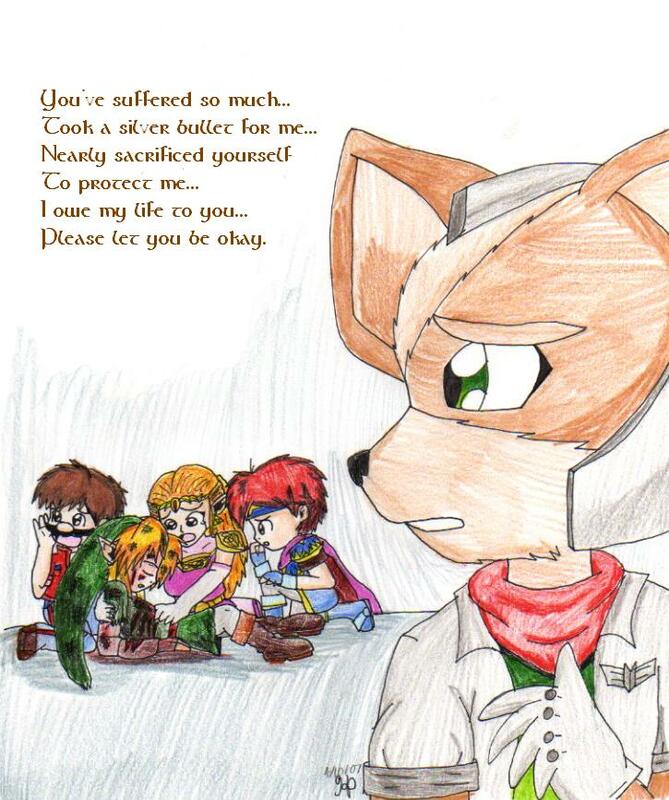 oh god!....poor link...i feel sorry for fox..